Have you guys had a chance to check out the 2016 Refashioners challenge this year? 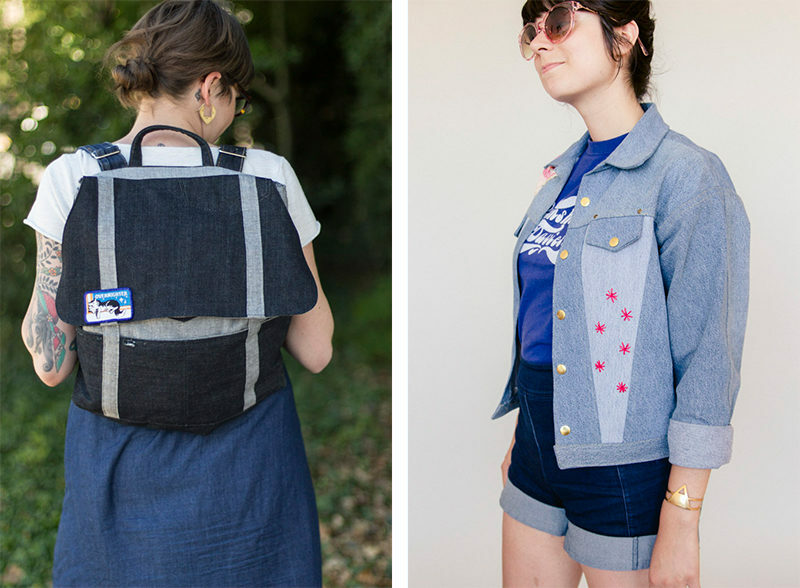 Every year, Portia over at Makery enlists a bunch of sewing folks to take on a refashioning challenge. This year, the theme is jeans. 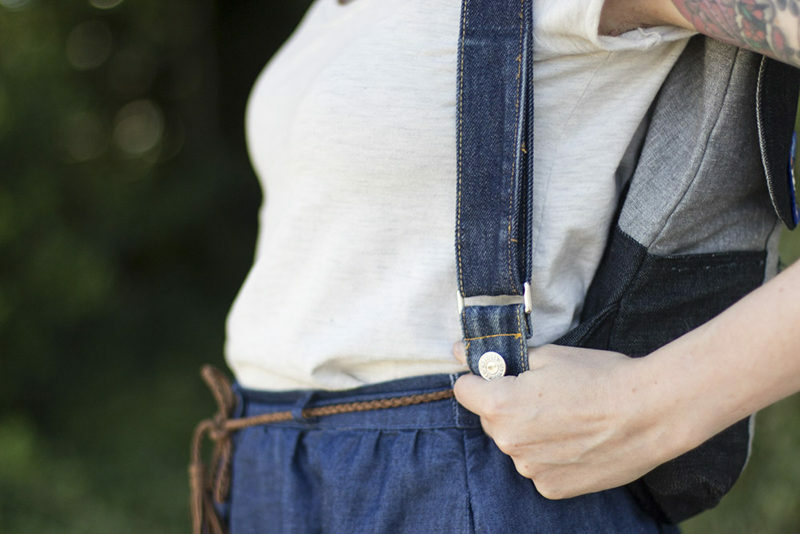 The idea is to take one or more pairs of jeans and transform them into something new. Jeanius! 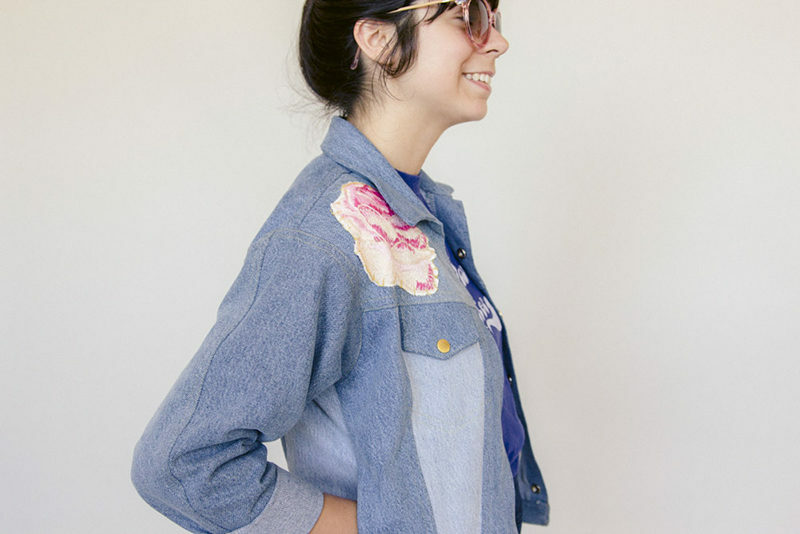 Sarai and Delaney shared their Refashioners projects earlier this week, along with 10 tips for working with denim. Today, Anna and I will show you what we refashioned. Since we both used hardware for our projects, there are some great tutorials and sources for buying hardware at the bottom of the post. I really needed a new backpack for summer camping, so I made the Cooper bag from the Walden collection. I’m proud to say that 100% of this bag is refashioned, even the hardware! I used the waistbands of two pairs of jeans for the backpack straps, keeping the button from the fly attached for decoration. The metal slides and D-rings for the straps came from an old bag I wasn’t using. I also had this sweater with heavy, metal snaps on the front, so I ripped those off (keeping my sweater intact for further wear!) and used two of them to secure the front flap on my Cooper. Using recycled hardware is the best. Sometimes I am really attracted to the closures from a ripped pair of pants or the buttons from an old, holey cardigan. Before cutting up garments for rags, I often harvest the hardware for my stash. 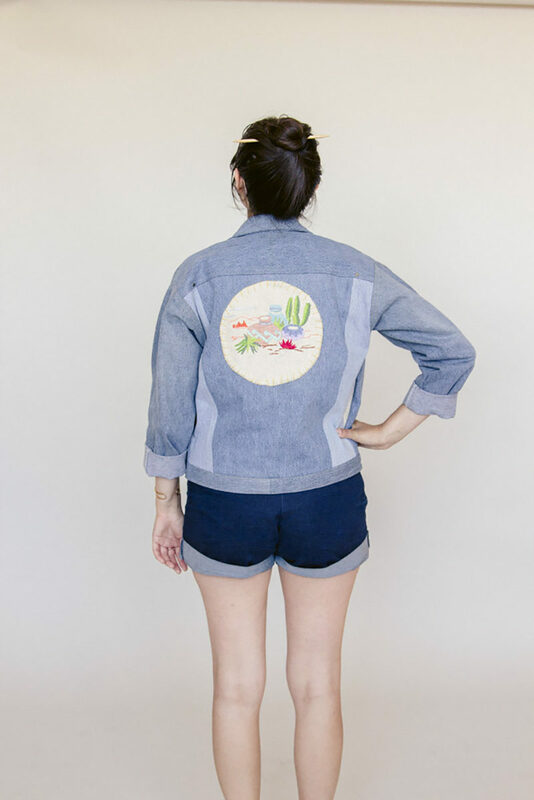 Anna copied the shape and silhouette of her favorite RTW denim jacket for her project. She refashioned two pairs of jeans, and when patterning, found that the two washes didn’t completely match. To distract from an unwanted patchwork effect, she added a few actual patches to the jacket, lots of hardware, and some really fun embroidery. Anna purchased heavy-duty snaps and rivets for her jacket from Bolt here in Portland. Heavy-duty metal rivets and snaps are a must when working with denim, as plastic buttons can break easily. If you don’t have a local fabric store that carries hardware for denim, don’t worry, we’ve got you covered! Upcycle! Ok, you probably can’t steal all of your hardware from old garments and bags, but before you toss out that old backpack your cat mistook for a litter box, pluck off the sliders and D-rings to use later. Rivets and certain snaps might be trickier to remove, especially if they’ve been hammered in too well. Taylor Tailor: Not only does Taylor have three really cute cats, he also blogs about his adventures sewing jeans and bags and has a great online shop with hardware and other supplies for sewing denim. Thread Theory: Masters of menswear patterns, Thread Theory’s shop is packed with notions and hardware for nearly any project you need. 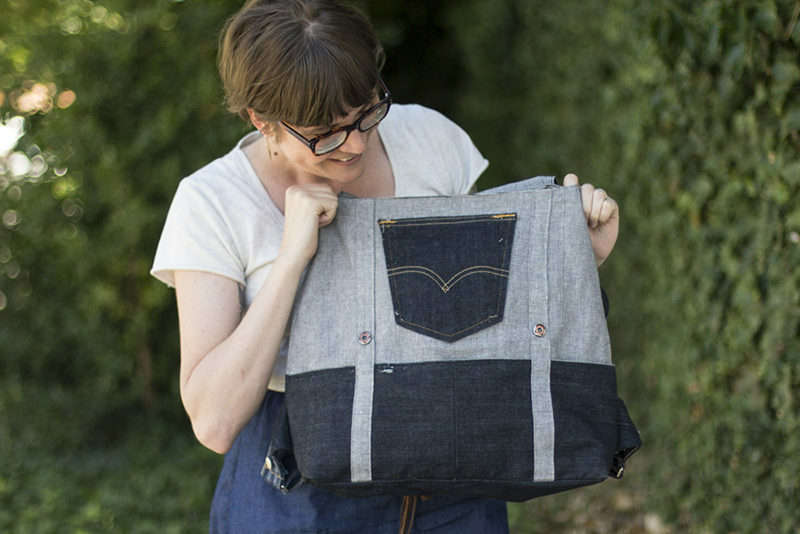 Closet Case Files: You can often find some great kits with hardware for sewing your own jeans, as well a some stellar patterns for jeans. Ohio Travel Bag: This shop is packed with hardware. U-Handbag: This UK shop sells hardware and all kinds of bag making supplies. Tandy Leather: Along with leathercrafting supplies, Tandy Leather also has a great selection of hardware (and tools)! Jean Rivets: “It’s hammer time” with Thread Theory’s tutorial. A Comprehensive Guide to Set-In Snaps: A tutorial for all things snaps from Seamwork. Bag Making Supplies and Resources: Fabric recommendations and links to even more shops with hardware. How to Install a Turn Lock: A smart detail for your bag. Sewing Your Own Jeans Ebook: Heather over at Closet Case Files will eventually have us all sewing our own jeans! 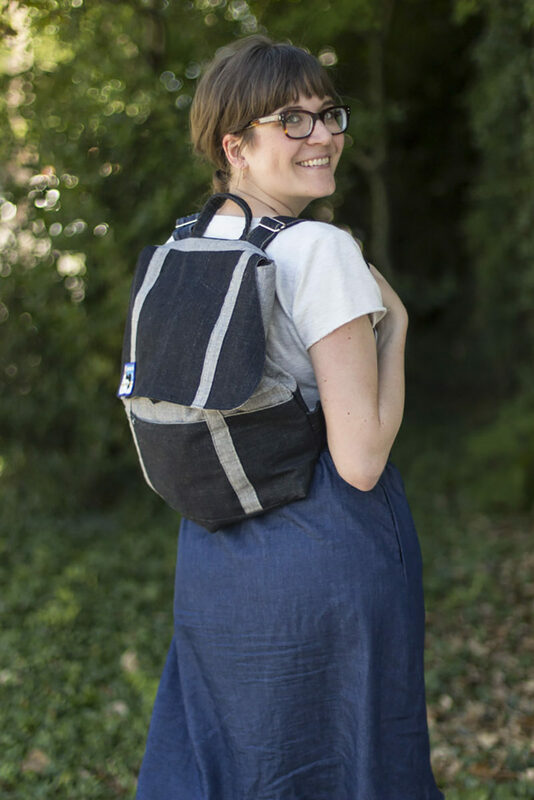 Where do you buy your hardware for bag making, sewing jeans, and other projects? Share below! I reuse all the bits from all the things – I can find hardware on existing thrifted bags I can never buy for myself. The tutorial for the turn clasp leaves out a layer of backing in the fabric layers where you plan to install the clasp. A chunk of felt or heavy interfacing will keep the grommet and the turn buckle from pulling out or sagging after use. If you add a clasp after you’ve made the bag, you want something that is sewn onto the surface, not puncturing the fabric. Plenty of great options there, too . A little planning goes a long way.